Day 279: Thursday Night — White Night . . . So, it’s Thursday night and we have yet another new episode of Chopped and Giving You the Business under our belts. Because we had a meeting with someone important to us tonight, Jean left straight up (or at least no less than 3 minutes after) 5 p.m. today in order get on home. It is fun to arrive home a bit earlier than usual – makes the whole night seem longer. But, this time of year…no matter what time you leave from work…it’s still HOT. Yep, today it was 97 degrees, but we’re promised a tomorrow of ‘only’ 89 degrees! Such is the life living in Central Texas! Come to think of it, we’re not sure it makes ANY difference what part of the State you’re living in. . .when the calendar turns from May to June–the result is HOT! With the house “empty” we’ve been able to clean up and prepare for the weekend. . .kind of nice when you consider that it’s only Thursday, but you know as well as we do that when you have two people working–keeping the house clean takes a back seat to keeping the house on a schedule. . .bills paid, vacuuming done, dishes clean and dishwasher emptied. . .and so it goes! We totally understand the young families today–a Mom and Dad who both work; child care at a center; a home; car payments. . .it’s tough raising a family. BUT, guess what? We get IT!! Yeah, it wasn’t that long ago that we were in the exact same situation as you. . .we were raising two girls with both of us working–one traveling at one point and then both traveling. . .it’s NOT easy. What these situations do call for is cooperation, communication and patience! Yep, that’s what it took 15 years ago and we suspect that those three guiding stars—cooperation, communication and patience—are still the basis for successfully raising a family! Because it was so crazy hot today, we decided that we needed a nice, refreshing white wine to talk about for this evening’s blog. 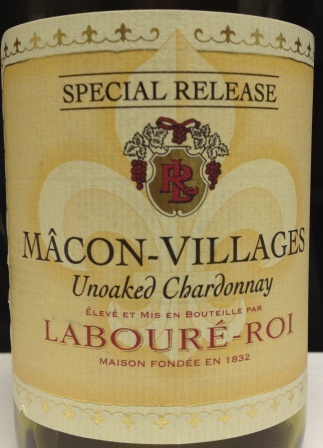 Having visited with Andy at Central Market North Lamar, we bought a really–we mean REALLY–nice French Chardonnay. This wine is unoaked and even though it’s a very young wine, the nose, the taste and the finish are something to behold! The wine shows floral, apple and citrus aromas and flavors, with mineral notes; a classic expression of Chardonnay from this appellation. Pairs with poultry, shellfish, grilled firm-fleshed fish such as swordfish, and salads. A very tasty wine for less than $15 a bottle–yes, it’s French wine, but we can tell you that it’s quality through and through! There is a “minerality” with this wine that really caused us to stop and taste. . .stop and smell. . .stop and swirl! Wines like this don’t come along ever day, but it appears that we are heading in that direction! The bottom line–good wine–fair price–un-oaked–not buttery, but very fruity and floral–we understand what’s at stake! Thanks for reading tonight and we hope you’ll be a part of this blog as we wind down to the last two and a half months of the Blog. It’s what SHOULD happen; please remember to enjoy your favorite wine responsibly and recycle whenever possible. Categories: Uncategorized | Tags: north lamar, white wine | Permalink.